Responding to the increasing number of severe injuries suffered by workers in the electrical industry, Sperian Protection has specifically developed the IsoArc protective gloves for use in low voltage applications where there is risk of an arc flash. Thermal damage caused from an arc flash can cause first or higher degree burns which are often complicated by ignition, melting and burning of non-flame resistant materials and non-arc resistant personal protective equipment (PPE). The IsoArc eliminates these risks by providing the highest quality PPE protection. The first of its kind, the IsoArc’s revolutionary design provides electrical insulation protection and arc flash protection combined in one protective glove, and does not compromise on usability. Measuring only 1mm in thickness, the IsoArc ensures wearers maintain the highest level of dexterity and mobility. Made from latex with a polychloroprene layer, the IsoArc is safe enough to use in low tension electrical working environments, while remaining thin and mobile enough to use in applications where small equipment and parts manipulation requires unusually good finger dexterity. The IsoArc includes grip finishing to ensure a firm hold and to reduce hand fatigue, thereby increasing worker productivity and safety. At the same time the chlorinated finishing enables easy fitting. Featuring a bicolour finish to allow for easy visual inspection, the flame resistant exterior is finished in a work-safe vivid orange, while the natural latex beige interior provides high quality electrical insulation. 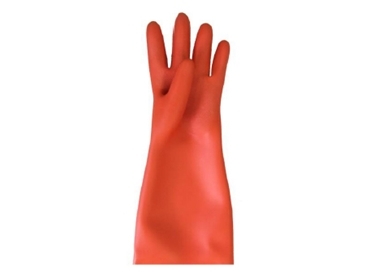 Each protective glove is available in a variety of sizes to suit every individual shape. The IsoArc carries a RC rating, ensuring it is resistant to acid, ozone and oil as well as very low temperatures, making them the ideal protective gloves to use in a variety of conditions. Meeting the highest industry standards with a usage tension of 1.000 Volts, the IsoArc is ahead of its time is safety and protection. Combining comfort and safety, the innovative IsoArc protective gloves are revolutionising hand protection for workers in the electrical industry.